For this Ad Rem, I would like to share with our readers a brief gem that we hope to publish soon as part of a larger work. But before doing that, I will recall something more fundamental. And in so doing, I will reveal the “setting” of this gem. Speaking of the work of Saint Benedict Center and the Slaves of the Immaculate Heart of Mary, Brother Francis often said, “We are three things at once: a crusade, a religious order, and a school of thought.” Usually, he would embellish this utterance with little summaries of each of the three. By crusade, he meant our two-fold apostolate for the conversion of America and the restoration of doctrinal sanity, beginning with that very fundamental dogma, extra ecclesiam nulla salus. (We put the definite article and a capital C here: The Crusade.) By religious order, he meant our Congregation’s First and Second Orders — brothers and sisters vowed to the life of the evangelical counsels. 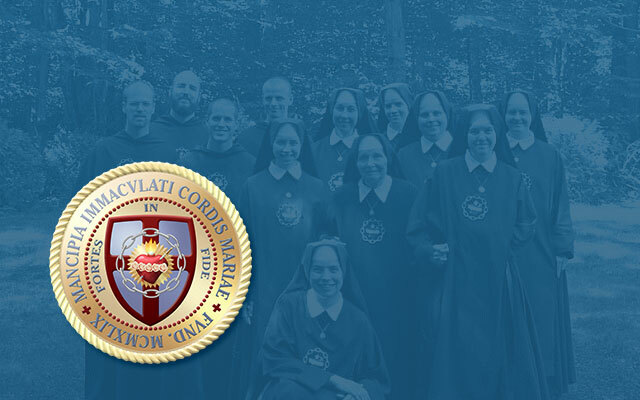 Our religious live under the same Rule, with duly appointed superiors, embracing the mixed life of contemplation and action, having hours dedicated to prayer, work, and study. By school of thought, Brother Francis meant the common wisdom of the Center, its approach to learning, its shared convictions and opinions in theology, philosophy, and mission, as well as the arts and sciences in general, inasmuch as they touch upon man’s ultimate quest for wisdom — salvation. Brother believed strongly that without a school of thought, the Congregation would falter and the Crusade wither. Contrariwise, he had the conviction that a flourishing school of thought will make the Crusade and the Order to thrive. With God’s grace leading, accompanying, and following, may we prove Brother Francis to be visionary in this second sense — by making our apostolate “bring forth very much fruit” (Jn. 15:8). Those familiar with Brother Francis’ lectures may remember the six reasons he gave to answer the question, “Why philosophy?” I am presenting these reasons below, from an edited transcript of Brother Francis’ first lecture on Logic. These thoughts form part of the bedrock of our school of thought. Philosophy is hardly a popular subject in our universities today. In fact, true philosophy, perennial philosophy, is non-existent as a particular curriculum of study. Whatever substitutes colleges give for philosophy today ought rather to be called “sophistry.” They are distractions for the mind, having nothing to do with wisdom. Instead of elevating the mind and making it more habituated to deeper realizations of the spiritual realm, modern sophistries are doing the exact opposite. Why is the study of true philosophy so important? First: It is natural to man to raise ultimate questions and to try to answer them. The questions raised throughout all the courses of philosophy are the most natural questions every man must raise. We raise them even as children, because they proceed from man’s essence as a rational being. Second: All of man’s activities and achievements — in the arts, in the sciences, in government, or in any field of civilized work — proceed from thought as from their proper principle. Therefore, these activities can be ennobled by good thinking about fundamental matters; contrariwise, they can be subverted by bad thinking. The art of thinking well is precisely the province of philosophy. Third: There is a historical tradition of true philosophy. (In Latin, that tradition is called philosophia perennis.) By uniting our minds to this tradition, we achieve a unity with so many brilliant thinkers of other ages and other countries. These thinkers not only include the great doctors of the Church (saints such as Thomas Aquinas, Bonaventure, Anselm, and Augustine), but also other teachers like Duns Scotus and the great educator Alcuin. Every Christian century — including the present one — has had its champions of perennial philosophy, each of whom built upon the wisdom of the past. Fourth: True philosophy is the handmaid of theology, ancilla theologiae. Without solid philosophic foundations, both piety and morality become superficial, unstable, and ineffective. Fifth: The spirit and method of philosophy save the mind from the narrowing effects of the scientific method so excessively dominant today in education. Philosophy upholds the reality of the spiritual, the primacy of the contemplative vision over the pragmatic. It restrains the scientific tendency towards materialism and other forms of monisms. Sixth: Sound philosophy is one of the tools used in the evangelization of the nations, involving, as it does, a common human value. Wherever one goes in the world, he will find a positive response when wisdom is discussed. In fact, the universal value of wisdom has somehow survived (even through distortions and corruptions), the thousands of years that have passed since the creation of Adam and Eve. There are many who have come to the Center like dynamos, only to leave it with the same sensational dynamism. In some particularly sad cases, they left the Church altogether through the back door of deranged thinking. I need not name them, but some have even gone on to become leaders of their very own bizarre sedevacantist movements. I have seen them come and go, armed only with their Denzinger’s and their arrogance. And in every case, their problem was a lack of docility, and a refusal to sit at the feet of a master like Brother Francis. In short, they didn’t want to learn how to think, and now they think very badly.